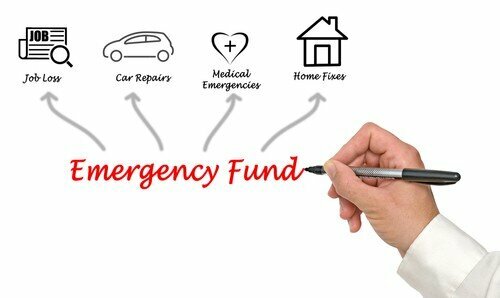 What is an emergency fund? An emergency fund is a stash of money, usually set aside in a separate bank account, that you have earmarked for emergencies only. You never know what life is going to throw at you, whether it’s a lost job, a medical or dental procedure, a significant issue with your home, or a major auto repair, so it’s always advisable to set aside money that you can use as a just-in-case back up. Most experts suggest a minimum of $1,000 as a start-up emergency fund, but it is always best to use an emergency fund calculator to determine a personalized estimate of how much your family needs to set aside, based on fixed monthly expenses and variable expenditures. Most experts agree that somewhere between three to six months of living expenses is the bare minimum required for a well-established emergency fund. After you’ve determined to start saving, consider following some of these suggestions for generating money to meet it. Set a savings goal. A healthy savings plan includes saving ten to twenty cents for every dollar earned. Yes, you heard that right. Saving 10 percent of your income is the best rule of thumb for putting a minimal amount of money aside for an emergency fund. Most people, however, may not be able to meet that goal, so think about what amount is realistic and feasible for your family. Make sure that you put that money aside first with each paycheck or determine to set up an automatic payment from your checking to your savings account. Taking it off the top, rather than seeing what’s left, will ensure that the saving is a priority and may reduce the temptation to run through the drive-through or make frivolous expenditures that deduct from the savings you intend to make. Put away that tax return. While it’s very tempting to purchase some things you’ve been wanting or to splurge on some entertainment, putting away that tax return is important. Most people generally don’t come into large chunks of money but once a year, and only if they’re expecting a refund, so think of it as a way to immediately boost that emergency fund. You may want to have it directly deposited into your emergency fund bank account so that you don’t even have to deliberate when it comes in. If you didn’t get much, if any, tax return this year, you may want to adjust your W-4 withholdings so that you will get more next year. It’s an easy way to “save” all year long without having to think about it. Save the change. Every time you break a ten or a twenty, or even if you break a five dollar bill, throw the extra singles or change into a jar. When the jar fills, take it in and put it in that savings account. Surprisingly, it takes very little time to generate a tidy little sum that is transferable to your emergency fund if you are consistent about putting every piece of change away. If you don’t deal with cash very often, there are spare change-saving apps for digital transactions that will help you collect small amounts of money over time. Setting up automatic deposits will definitely assist in generating cash flow, however small, into that emergency fund. Sell that stuff. According to becomingminimalist.com, minimalism is, at its core, “the intentional promotion of the things we most value and the removal of everything that distracts us from it.” Many millennials are moving toward purposeful decluttering of their lives, their homes, and their personal spaces. Consider gathering and selling unnecessary items to generate money to add to your emergency fund. Having a garage or yard sale or selling unwanted items on the internet will provide a little extra. Cut expenses or take a second job. Neither of these is particularly easy to do, but they will generate expendable cash that can be earmarked for your emergency fund. Look carefully and critically at changes you can make in every area of your monthly expenses, from phone bills to food purchases, and determine what can be reduced or eliminated altogether. If you’ve cut your expenses as much as is feasible, perhaps there is a side hustle that you can do in your spare time. Consider part-time gigs that you can do from home or without any business start-up investment. Starting an emergency fund is a worthwhile investment of time and effort. Not only will it contribute to your overall financial future and monetary viability, but it will also create a peace of mind that has no price! Do you have some suggestions for generating income? Have you been successful in establishing an emergency cushion? Share your ideas here.